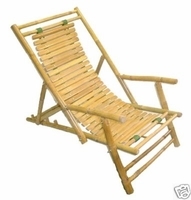 These folding bamboo recliners are made from an eco friendly, high quality all natural durable bamboo. Set has been fumigated and fully treated for maintaining its high quality, perfect for indoor and outdoor use in your home or business. - Bamboo lounge chairs can adjust to four different sitting positions. - Can fold flat for easy storage.